We met Charlotte and Isa during our three-day jungle tour in the north of Thailand. They are from France, but they have lived in Bangkok for in the last 4 years (Charlotte), respectively 6 years (Isa). They met each other in Bangkok through some common friends. Both of them are full of life, adventurous and joyful. 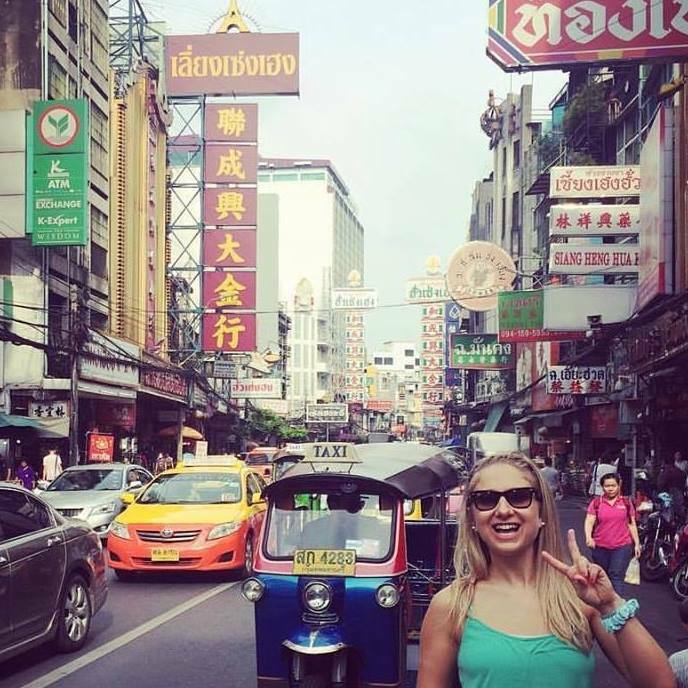 Ancuța: How did you start working in Bangkok and for how long have you been living here? Isa: Right after my studies, I really wanted to have a working experience abroad. With a French company, I found a job and went to live in Ho Chi Minh in Vietnam. After 2 years, they offered me a job in Bangkok so I took the opportunity to move cities! 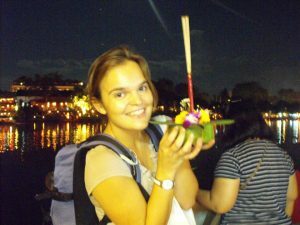 Charlotte: I have been living in Bangkok for 4 years. Originally I thought I would stay a year or two and now I don’t know when I will leave anymore. I had the chance to find a job here in Bangkok, while I was still in France. I just finished my studies and found a position as marketing manager for a wine importer. A: What were your first impressions of Bangkok? I: Extreme city, full of contrasts from tradition to modernity. C: I didn’t like it at all! On my first day, I arrived in Silom during a long weekend, the area was so quiet, I was totally lost, in a foreign country where most of the people do not speak a word of English and in a place that looked like a ghost town. It was tough. On the same first day, I went to visit an apartment, located in Nana area (kind of red light district full of go-go bars). I had no idea what kind of neighborhood I was going too, well I was surprised and definitely not a fan of the atmosphere. Afer a few days, I started to meet some kind people, found the place and people I would live with for the next 2 years. I took me a few weeks to get accustomed but once I felt more at ease, I was all set and ready to discover. I: I work for an e-commerce company launched by Rocket Internet and purchased last year by Alibaba. I am focusing on Advertising and Digital Marketing, Lazada. C: I work for a wine broker based in France. I am the export manager for South-East Asia. A: How is it for you to live so far from your family? How often do you visit them? I: Living in Thailand is my choice and makes me very happy, I feel richer, I feel a better person overall. Then, indeed, like any expat life, I miss my family, but they come to Asia once a year and I try to go back 1 or 2 times per year for weddings or Christmas for instance. They understand and respect my choice and feel happy for me! C: The first years, I was on a local contract, I would go back only once a year. It was long to wait for a year but my family came to visit and year after year, Bangkok became home. I now come back more often, twice a year usually, I love it and enjoy every minute of it but when I am away I don’t miss my country. I decided to not miss my people, I can’t change the fact I am far away so why being sad? I prefer to enjoy every minute 100% when I am with them and enjoy my life here and the people in Bangkok when I am in Asia. A: How is life in Bangkok compared to your life in France? I: Life is BKK is an everyday excitement. I feel that Asian cities are vibrating. I work with 50 different nationalities on a daily basis: that makes me more flexible, more opened to change, to a different point of view on things. I can’t picture myself anymore in a 100% French company. C: Very different, I don’t really speak the language, just the basic Thai so not enough to start deep conversations this already changes the way you interact with people. Regarding the way of living, life is cheaper on many levels, the weather is hot and wet but sunny every day. A: For how long do you plan to stay here? I: I don’t have a plan! I live a bit day after day. I don’t always know if it’s a good thing or not but that’s what I do! C: There is no plan, I try to keep my mind open and I am ready to move or stay if an interesting opportunity arises. A: Traffic in Bangkok is crazy. What do you use to go from one place to another? I: Moto taxis or BTS (Skytrain) during the week and Taxi during the weekend when traffic is less chaotic! C: Yes Bangkok traffic is crazy and you never get used to it but you learn how to avoid it, you learn the shortcut and which mode of transportation to use where and when. I am usually driving a motorcycle. It makes my life so much simpler, but I also use the BTS (Skytrain), MRT (Mass Transit Railway), Boat bus and taxis (cars and motorcycle). A: What has this experience taught you? I: I am learning so many things, every day, every moment, I learned to be more curious, more open, more aware of the privilege I have to live the life that I live. C: The greatest thing I learned here is that there is not one truth and if there is a truth, it is multiple. We all see and experience life through our own beliefs and habits, and something different from my culture is not wrong, just different. It feels good to put your own way of living in perspective and understand that the Western way of living is maybe not THE best or the example to follow. A: Can you tell us some things you’ve learned about Thai people/culture? I: Thai people are famous to be “always smiling”, they are deeply nice and careful but till a turning point where they can switch and become very aggressive. The Kingdom of Thailand is very respectful and committed to their king and the monarchy as the recent 1 year mourning period showed it. C: They are one of the most helpful people I ever met and their ability to smile all the time, it makes my everyday! A: Have you learned the Thai language? If yes, how difficult it was? I: I learned Thai for 3 months and then was too absorbed by my work but I still know how to chat a bit which makes the difference on a daily basis not to be seen as a simple tourist! C: No, only the basic conversation to survive in Bangkok. A: What would you tell to one of your friends who would want to move to Bangkok for a few years? I: Just come and see! C: Yes, please, come, experience a new culture and grow! Favourite place to be in Bangkok? I: Ariyasomvilla, the perfect restaurant/coffee place for a peaceful moment in the heart of the city. C: Chinatown in general and the rooftop of the Riverview guesthouse. C: Bangkok, there is so much to see! The weirdest thing you ate in Thailand? C: I am not too adventurous, probably a scorpion? C: Shark bay in Koh Tao. I: Laap Mu (Fresh minced pork salad with herbs). C: Khao Soi ( Nothern style curry). Thank you, girls, for accepting this interview and hope to meet you soon. If you want to receive similar articles on your email address, you can sign up here. You can also find us on Facebook and Instagram.